With a lot of doubts going in, the book was actually a pretty quick read. I could see many people, that were reading it when it was released in 1984, getting lost in the technological terms. I was also amazed at the uses of the words "cyberspace" and "matrix" which of course have broader appeal today yet mean pretty much what they were intended. 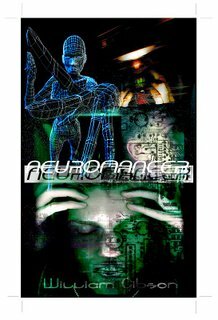 (Actually, there is a very interesting breakdown of the similarities between Neuromancer and The Matrix which is worth viewing.) Also noteworthy was the mention of Johnny Mnemonic. Yes, it seems that Gibson wove the character of Molly Millions into a trilogy of stories about the seedy futuristic area called the Sprawl... including this one. If you remember the name, Johnny Mnemonic, you may also recall the 1995 movie starring Keanu Reeves. That may be the only negative that I had about the book as I could not separate the character of Case in the book from the thought of Keanu Reeves (the description just fit him.) Overall, very good book and one that I'm a little shocked they haven't attempted to convert to film (as the video game in 1988 stank and looked more like Leisure Suit Larry.) Here's hoping that I find a few more books that I may have bypassed that excite my imagination. Interesting, not sure I will pick it up, but then again, I did love Matrix. Glad to see you find more and more time for reading.